Lasers on pistols were a fancy, but avid idea for shooters just a couple of decades ago. But with improving technology, and the superior performance of laser-aided firearms in combat, laser sights have become a tacti-cool accessory among shooters. Using a laser sight on a pistol has its own advantages, along with a few drawbacks. Here, we’ll try to explore the idea of mounting laser sights on your handguns. 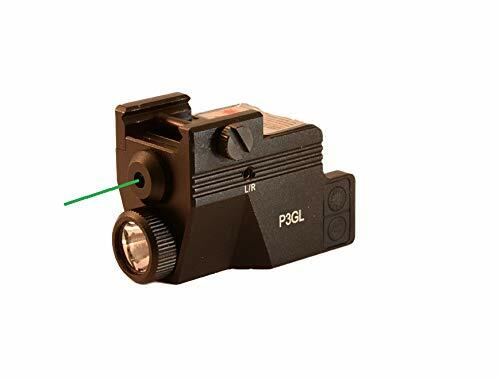 We will also review some of the most enticing and effective pistol laser sights on the market, in case you make up your mind to buy one after you read this review. So stay tuned! The very first benefit of investing in a laser sight for your pistol is - inadvertent accuracy. Although, both these words (inadvertent and accuracy), sound contradictory, but together, they refer to a laser’s top benefit. A laser can make the most amateur and novice shooter more accurate compared to his/her performance with an iron sight. A laser projects a point of impact right on the target, where you want to hit it. This helps the shooter take more accurate shots, especially under low lighting or night conditions. Lasers are also quite effective in survivalist situations, where people may get caught up in anxiety that can cause imminent fatigue. A laser allows you to aim and shoot at a target even under an uncomfortable or not-so-perfect shooting position. A laser mounted on your handgun can also be your best chance of survival in a self-defense situation. Here comes the real debate; color of a laser. Many people seem confused about the color of the laser. Some favor red lasers, while others go with green ones. But we will differentiate between them on the basis of data and facts. First of all, red and green are the most easily visible colors in low-light conditions. That’s the reason why vehicle tail lights are red in color. On the other hand, green is the most easily visible color during broad daylights. That’s why traffic lights are green. Comparing both red and green lasers in daylight and dark conditions, the green color definitely has an advantage. Green color lasers are more visible than red ones in broad daylight. However, you still have to struggle with finding the dot. Additionally, green is the most easily visible color to the human eye so, it also works great in the dark and at long ranges (up to 100 yards). However, on the contrary, both red and green color lasers work almost the same at short ranges, between 15-20 feet. It is also important to note here that green lasers are a bit more expensive than red ones, and also tend to drain batteries faster. Now you know the advantages of adding a laser sight to your pistol. The next step is to find the right one. We scoured the internet to find and compile a list of the best pistol laser sights on the market. The sights reviewed here are widely used and have been approved for quality and performance by a lot of users. The very first product on our list doesn’t really need an introduction. 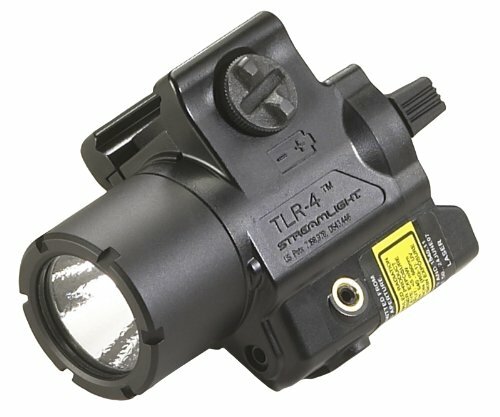 The Streamlight TLR-4 69240 is an amazing combo which can be mounted on your handgun. This is a combination of a LED light and a red laser, which lets you kill two birds with one stone. The light features a rail clamp, which easily attaches to the bottom rail of your handgun, without the need to empty the weapon. The setup has a polymer-based construction, with an anodized aluminum face cap for the light. It is durable and resistant to water, heat, and dirt. A windage and elevation adjustment screw has been mounted in the brass bushing for zeroing the laser when needed. The C4 LED lights provide illumination of 125 lumens, which is bright enough to clearly see objects at a distance of 75-100 yards. The light is powered by one CR2 battery which provides a continuous run time of 1.5 hours for both the laser and the light and 11 hours for only the laser. The ambidextrous steady/momentary switch lets you use the light as an when needed. Plus, the three-position mode selector switch provides options for laser only, light only, and laser-LED operating modes. The 640-660nm red laser allows you to shoot at distant targets. The installation and removal of the light requires no tools whatsoever. Each of these lasers has been serialized for positive identification. Additionally, these lasers are made in the U.S.A. by Streamlight. So there’s no point in doubting its quality. 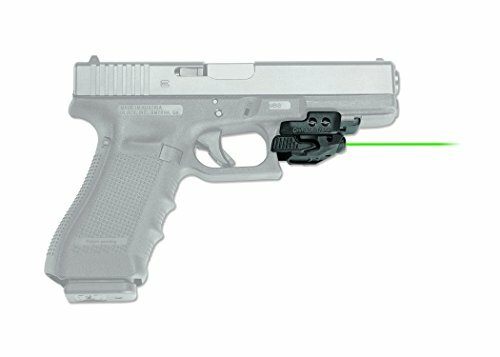 The Streamlight LED-laser combo is a cost-effective solution for mounting on your handguns. The powerful laser will let you shoot distant targets. This red laser sight from Tacticon is perhaps the most economical and amazing product on our list. This product features an aluminum-based metal alloy body, which stands strong against impacts, water, moisture, and dirt. The laser is quite powerful (625-650nm) and allows you to sight targets at a range of up to 100 meters. It is compact, small-sized, and has a low profile, so it doesn’t interfere with shooting. The simple push-button on/off switch at the rear end of the laser is easy to use. The laser features a small piece of rail mounted on its base, which can be used to mount any other accessory over it. This makes the laser rail space-free as the amount of rail space taken by the laser can be used to mount another accessory. Plus, this extra rail on the laser is removable, in case you don’t want to carry it. The sight is fully adjustable for windage and elevation. Additionally, the package includes all the necessary tools for making adjustments to the turret settings, changing batteries, and for installation, along with a set of six batteries. The freebies don’t end here since the manufacturer offers a lifetime free replacement warranty on these products with no questions asked. The availability of all the extra tools, a lifetime warranty, and the low price of this laser sights makes it a complete no-brainer for buying the product. 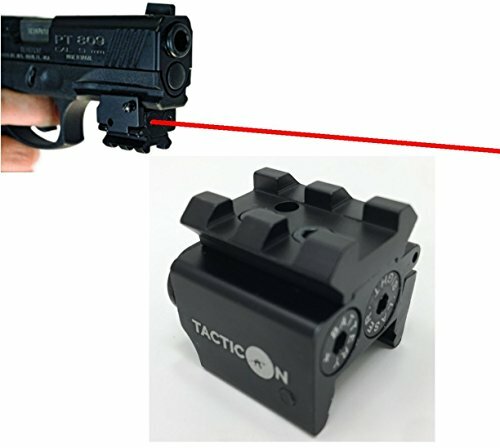 The Tacticon laser sight is an economical addition to your handgun, which also has rail space for mounting a tac light. The full lifetime warranty is a complete win-win situation for you. The Crimson Trace CMR-206 is a green laser sight, which is appropriate for both day and night use. The sight features a curvy and compact design which can be mounted with ease on most handguns regardless of their frame size. The four fit inserts on the sights allow easy and quick installation on handguns with a railed base. The sight has a 515-532 nm class 3R visible green laser, which is the brightest laser allowed by law. It will allow you to sight targets at up to 50 meters with ease, regardless of the lighting conditions. The sight features an ambidextrous on/off switch on either side, which also has constant-on, momentary, and strobing laser modes. Additionally, the laser features a five-minute auto shutdown feature in case you forget to turn it off. The laser sight can be easily adjusted for windage and elevation, using the tool provided in the package. The laser sight instantly fits any firearm with a standard Picatinny or Weaver rail. The Crimson Trace laser light is a compact and easy to use laser which is covered by a three-year warranty and a free-batteries-for-life program. The green laser lets you shoot targets in bright conditions, which can be a plus. This Lasermax offering has been specifically designed for the Ruger SR series of handguns. The laser runs off a single 1/3N Lithium battery with a runtime of around four hours. The housing has been made entirely from polymer, which makes it lightweight. It is fully adjustable for windage and elevation using a dedicated tool. Plus, a distinct ambidextrous activation switch allows the user to easily activate the light with the shooting hand. The laser has an integrated rail system at its base which can be used to mount other accessories like a tac light. The light can switch between a constant beam and strobing modes, which can help you conserve power. Additionally, the laser has a ten-minute auto-shutdown feature which also prevents any inadvertent discharge of batteries. The laser can provide a constant battery life of four hours, which is definitely a plus, since the only disadvantage of laser lights is the dead batteries when you need ‘em the most. This is the best laser sight for Ruger SR series handguns, so consider buying this if you possess one. The Laser Max laser sights are designed for Ruger SR series of handguns. The laser is lightweight and easy to use. It is a bit pricey compared to other similar lasers, but still perfect for the SR series. 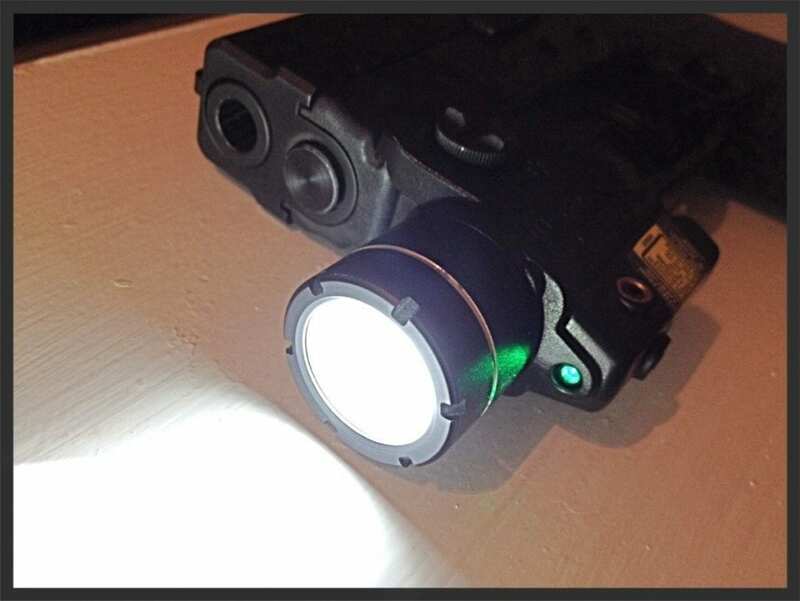 The HiLight laser sight is a combination of a laser and a tac light. It features a bright LED light with an illumination capacity of 500 lumens, which is enough to sight targets well beyond 100 yards. Plus, the green color laser is clearly visible during day and night, so the laser improves your accuracy under all lighting conditions. The setup has separate buttons for activating the laser and the light. It can also be switched between steady and strobing modes for a tactical advantage and battery conservation. 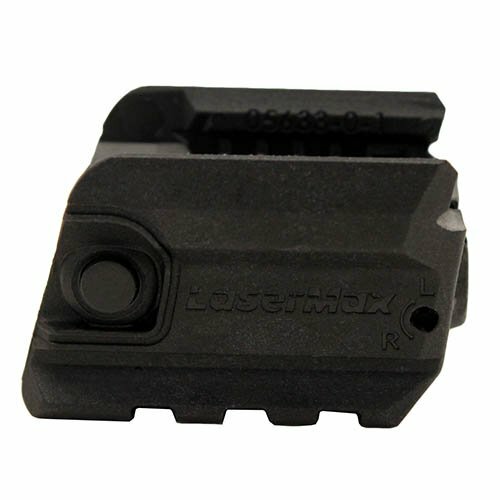 The laser sight is extremely low profile and can be mounted on sub-compact pistols with ease. It operates using a rechargeable battery and the package includes a USB charging cable which is used for recharging the battery. You can also charge the batteries on the move by using a power bank. Additionally, it is fully adjustable for windage and elevation. The combo tool has a rechargeable battery which can be charged on the move. The green laser works well in daylight and is perfect for sub-compact handguns like the G-32 and G43. You must consider certain aspects before buying this type of device. These factors could mean the difference between failure and success in a life or death situation. Plus, all the products reviewed in this article have been compiled based upon these factors. A good pistol laser must be compact and lightweight so it doesn’t add to the overall weight of the pistol. It must also be holster friendly, so you don’t have to search extensively for the right holster to contain it. The on/off button must be easy to access and other settings must have intuitive controls. A prime concern with these products is their battery life. If not taken care of, the battery of a laser sight can ditch you in the most needed moments. So it is a better option to choose laser sights with good battery life and slow power drainage. The device must be durable enough to withstand the recoil of the weapon and other pressures it will be subjected to. Such sights must be able to hold zero, since zeroing-in laser sights requires a specialized tool and some effort., as opposed to optic scopes which have finger-adjustable knobs. Lasers are classified under the category of hazardous devices if not used in the right limits. Always check if a laser falls under the right and safe category and is approved by law for civilian use. All the sights reviewed by us here are safe to use and have been approved by authorities for civilian use. Laser sights are a useful addition to your handguns since they help with improving your overall accuracy, especially under low light conditions. A good laser sight must be compact, lightweight, easy to operate, and durable enough to withstand pressure and recoil. Laser sights can make all the difference in low light, self-defense situations, so it is worth considering.